Welcome to the enchanted, Casa Grande! This amazing property is nestled in the hills of the North-side: near the Governors Mansion. On over an acre, it has a wonderful private setting. Outdoor living spaces abound. There is a stunning courtyard w/2 outdoor fireplaces with seating for 25+ guests. The front patio captures the amazing Santa Fe Sunsets and a Pergola offers a great retreat like setting. Inside the house has a fantastic floor plan that allows privacy, as all bedrooms offer in-suite bathrooms. The Master has a his and hers bathroom and closet. An alternate master's suite downstairs also offers his/her bathrooms. Both downstairs bedrooms offer exterior access as well to private patios. The family room is open and spacious w/a wet bar for entertaining. The dining room is a gorgeous space that can accommodate up to 16 diners at once. (A game table for 4 has beautiful views off the dining). The formal living room has a shepherd's fireplace and gorgeous sunset views. A formal entry hall is terrific for entertaining and can accommodate a small band. This amazing and unique property is a perfect, secluded hide-away, it can be used for the ultimate in entertaining. 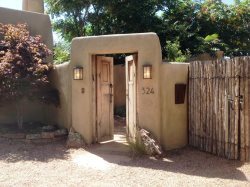 This beautiful Santa Fe home mixes elements of traditional Santa Fe, like Vigas and Portals, as well as contemporary architecture in the newer areas of the home. Day times are sunny and beautiful; night times are romantic and magical. This is a truly one of a kind Santa Fe home. Approximately 7,600 net square feet. PS......Owners favorite place to Relax "ABSOLUTE NIRVANA BALINESE SPA & GARDENS" - Located at 106 Faithway St., Santa Fe, NM 87501. Air-conditioning - In the three upstairs bedrooms only! The downstairs bedrooms are not equipped with A/C. Thank you for everything. Your staff made my 50th birthday extraordinary! Megan Crawford set the stage for a fabulous visit with her warm welcome. The property itself was way more than we expected. This is the second time we have rented from Casa de Santa Fe and will certainly rent again from you. Both rental experiences have been very satisfying. Casa Grande was such a beautiful house we really enjoyed our stay I would say it is one of the BEST homes in Santa Fe with every inch of the property being super cozy!! Outstanding property and appreciate the ability to only rent for two nights.